If your little one is in love with this friendly and fun pig, use the items from the Peppa Pig Party Supplies to build a birthday event she'll never forget! Get everything from tableware supplies like plates, cups, and napkins, as well as pink favors like coloring books, alphabet crackers, and candy rings, and decorations like hanging swirls, balloons, and more! From the land of tea and crumpets, Mummy Pig, Daddy Pig, George and of course Peppa have come to make your little piggy’s party an event to remember. For years, this family of pigs has been capturing hearts around the world. Who’s going to come to the party? Zoe Zebra? Emily Elephant? Delphne Donkey? You make the guest list, and we’ll do the rest. With everything you need for the big event, our Party in a Box will have the little ones squealing with delight as their favorite cartoon comes to life. It’ll be more fun (and much cleaner) than playing in the mud! At Birthday Express, we’ve made shopping for your party easy. From themed napkins to personalized banners, you can shop for items individually, or if you’re running out of time and don’t quite have it in you to nail down every detail on your own, our Party in a Box comes with everything you need. Whether you’re just hosting a small party or you need a few extra sets of tableware in case some unexpected rabbits and kangaroos stop by, our Peppa Pig Value Pack will ensure you have the decorations you need. Includes tableware for eight people and party favors you don’t want to be caught without. How do you make your child’s Peppa Pig themed birthday into a pigsty without turning your house into a pigsty? We’ll show you how. At Birthday Express, we’ve got the decorations to transform your kitchen or living room into a cartoon world that both you and your children will love. We’ve got fixings for a piñata and even pig noses for you! So, whether it’s balloons or banners, tableware or table cloths, we have plenty of accessories in the best deigns and colors that will make the other parents think you hired a professional party planner. Nothing adds a whimsical sense of fun to a party like balloons. With this all-inclusive kit, you’ll receive a total of ten balloons, along with curling ribbons and a weight. An ideal centerpiece to any party, this perfectly matched bouquet will inspire your kids to float away with their imagination! It’ll be hard for those young ones to contain themselves with the amount of fun they’ll be having. You can try to tell them to keep it on their plate, but come on, this is cake and ice cream we’re talking about. 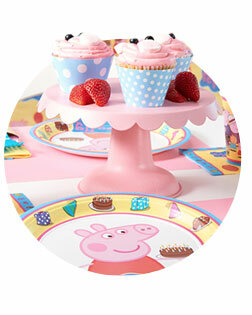 With the Peppa Pig Plastic Tablecover, you’ll save your table and your breath! They’ll probably beg and plead with you, but it’s unlikely that you’ll give in and let your kids and their friends eat with their hands or faces, like the little piggies they are! 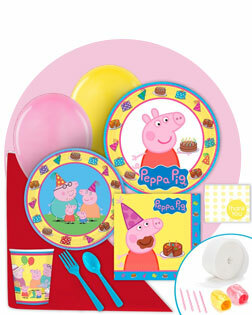 With our Peppa Pig tableware, you won’t hear a peep. They’ll be delighted to eat and drink like human kids. Our plates, cups and napkins come with unique pictures of Peppa Pig and her family. If you want even more variety, check out our desert plates. High-quality forks and spoons are both durable and convenient. With such fun images, your kids will be sure to join the clean-plate club. Finally, it’s all in order. The decorations are up, the cake has been picked up and you've even talked your husband into wearing that set of ears and nose you picked up in our Pig Accessory Kit! Are you forgetting anything? Oh wait, in a few hours, a pack of piglets with all their piglet energy will be running through your house. How will you contain them? Don’t worry. From playing dress-up to making bubbles or smashing a piñata, we’ve got all the best activities to capture their imaginations and make the day even more magical. What’s a birthday party without the sound of children laughing as they line up to take a whack at the piñata? With this Heart Pull-String Piñata, we’ve put a unique spin on a classic party favorite. Instead of hitting it, kids pull on the strings until it bursts and sends candy soaring through the air! How can water turn into floating bubbles? There’s nothing like watching the joy on a child’s face when they blow bubbles. These bottles will liven up the party or make a perfect party favor for guests to take home. You might even want to get a few bottles for you and your friends! Everyone loves a party, and your little piglet is probably overjoyed to have all their friends come over to eat cake, pull open a piñata and open presents! You want to be sure to let their friends know how much you appreciate their coming over and making the day so special! Plus, every party is better when everyone gets to go home with a little something! At Birthday Express, we’ve got the perfect party favors for your guests. Hand these out and your child’s Peppa Pig party will not be forgotten; their friends will be extra eager to celebrate their next birthday! They’ve seen Peppa Pig and her family on television and they’ve just gone to a great Peppa Pig birthday party, now it’s time to bring out their inner artist and let them draw their own Peppa Pig! 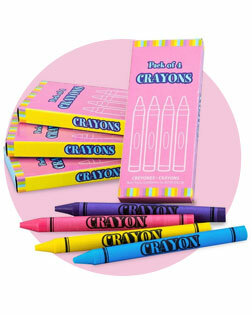 With these Pastel crayons, they’ll have all the colors to do just that! Plus, you’ll be encouraging their creativity! 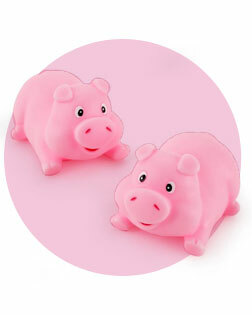 An ideal party favor for your little one’s pig-themed party! These little oinkers are a wildly fun alternative to squirt guns. They also double as a way to cool off on a hot summer day! Buy them individually or save by purchasing a pack of eight.